The safest way to play Torgar’s Quest is to play defensively. 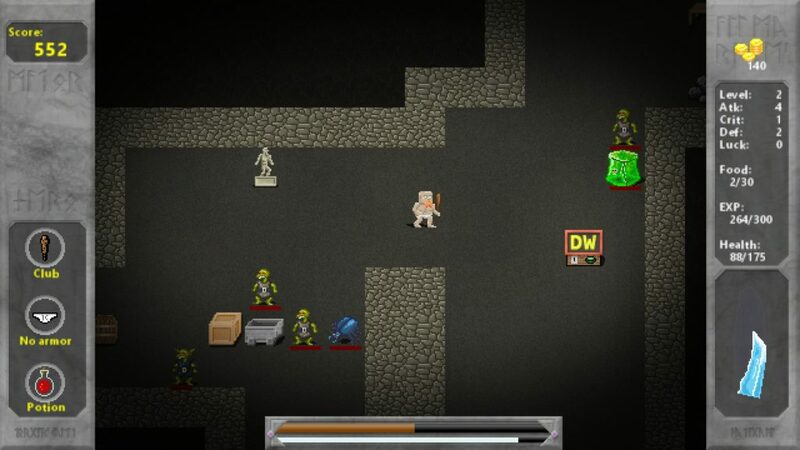 Being a roguelike game, there are no do-overs, no save points and no mercy. Here is a collection of tips to help you play defensively, and live longer. To win the game, you need 7 crystal shards. To find them, you must search for them. So don’t rush through the level portal as soon as you find it, only when you have explored the current dungeon level to your satisfaction. Weapons and armor upgrades, as well as potions and DW stores are also scattered around the levels for you to find, and without upgrades the monsters you meet will eventually become too strong. Food is used when resting (R key / right bumper) and gives you back a small amount of health per unit consumed. You can carry 30 food units, so spend them wisely. Resting is impossible with monsters nearby, so resting up right after clearing an area is ideal. Potions (E key / left bumper) fully restore your health, but you can only carry 1 at a time. For that reason you should use it only in emergency situations, or if there is another potion or DW store nearby for a replacement. Using potions too soon, can come back to bite you later. If possible, you will want to have a potion on hand at all times. Occasionally you will encounter overwhelming resistance. Maybe there is a rare spawn that is too tough to beat, or you are getting swarmed by creatures. There is no shame in running. The monsters will chase you, but they aren’t very smart. If you have no potion, running away and hitting destructibles along the way can result in a fresh healing potion, which may then turn the tide. Or you may simply get lucky enough to outrun your enemies, rest up and then lure them towards you, one or two at a time. The point is, that staying in combat is not always the best way to go, and you might still come back and finish the job later.